It might be very intuitive for some to expose their plants under very bright conditions, hoping for magical results. However, those magical results are not necessarily pivoted just on the intensity of light. A PAR light meter will help you get the right light color! 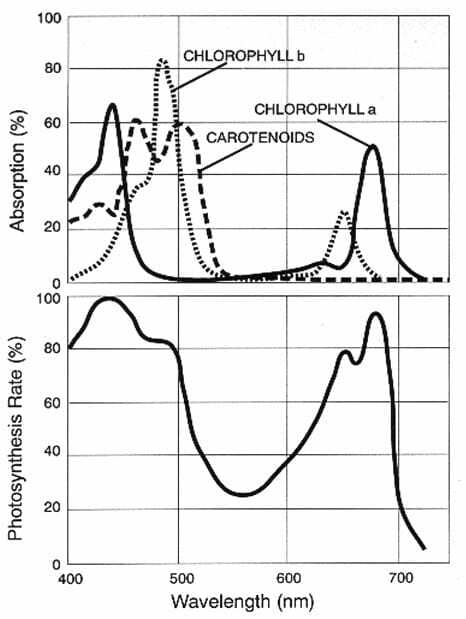 Our plants reflect most of the light and put only Photosynthetic Active Radiations (PAR) into use. The PAR belongs to the wavelengths between 400 and 700 nm in the light spectrum. 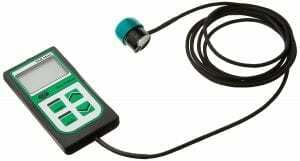 A par meter will determine whether this PAR value a light produces is right for your plant. 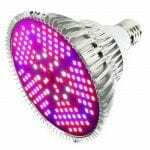 Therefore, it is a good idea to monitor PAR from LED grow light by getting your hands on the best PAR meter you can buy. 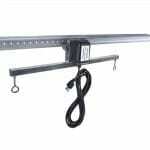 The following are reviews of four of the best PAR meters for LED grow lights. I hope these light meter reviews will help you in your buying decision. The Sun System PAR Meter could be used to measure PAR from your grow light to natural sunlight. 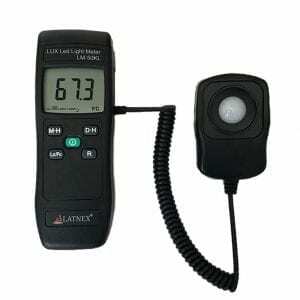 This digital light meter comes with an integrated sensor or a remote sensor. 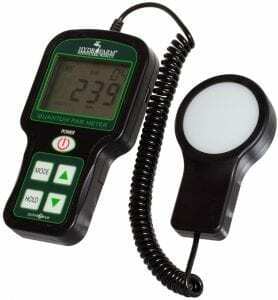 It is a super compact light meter that can be used conveniently. Four user-friendly buttons operate this sun system PAR meter. In addition to that, it gives the option of manual and automatic operation. In each mode, up to ninety-nine readings could be taken and the spatial average is displayed. Lastly, the product comes with a 1-year warranty and a pretty useful user guide. Take in consideration that this product is not waterproof. With a price above 300 dollars, this is not a cheap par meter, but really one worth considering. The Light Meter LM-50KL could be employed for measuring light intensity for LEDs and other visible-light sources. The product comes with the dimensions of 9.3 x 5.1 x 2.9 inches and weighs 14.1 ounces, and its simplicity is maintained by incorporating only five buttons on the face. The light meter measures the light intensity in foot-candles and lux. One foot candles denote the illuminance cast by the surface of one-candela source situated one foot away. Some of its applications include, but are not limited to, factories, warehouses, office buildings, restaurants, schools, etc. This is a cheap par meter. It’s a good option for people with a low budget. This is for the ones who are going to buy a cheap par meter but are still looking for decent quality. 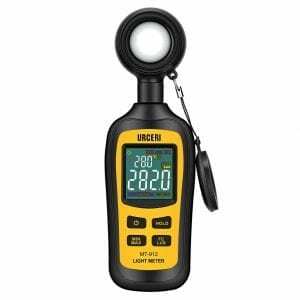 This digital par light meter and ambient temperature measurer, known for its very high accuracy, is capable of recording luminosity from 0 to 200,000 lux. This is a budget option and a good plant light meter. Don’t expect crazy functions on this par light meter. It displays the results in its 4-digital beautiful color LCD that also indicates the minimum and maximum readings, battery status, and other useful features. Moreover, to conserve the battery, the device features an auto power off function that switches it off if not used for fifteen minutes. On top of everything, the light meter exhibits a handheld, compact design that is also very lightweight to enable a comfortable operation. Coming with a user manual and 3 1.5volt batteries, this light meter allows the usage in a diverse range of applications. This par meter is well known for its price-quality ratio. A cheap par meter that gets the job done. The highly accurate PAR light meter from Hydrofarm features a quantum sensor that measures wavelengths precisely. Dealing in wavelengths from 400 to 700 nm, LGBQM Quantum PAR Meter measures the PAR up to 10,000 umol/s. This PAR meter gets further optimized by featuring a data-logging facility, coupled with the standard mini-size USB cable. Moreover, it also boasts a constant linear response curve which results in a higher accuracy as compared to the Gaussian response curve. To help you keep the battery status in check, LGBQM Quantum also incorporates a low-power battery indicator. As for maintaining the accuracy of the results, it also exhibits effective calibration modes. Priced just above 100 dollars, this is a mid-range light meter. It has more functionality than the budget option and is still a cheaper light meter than the high-end options. This is a good option if you are looking for more functionality in a plant light meter, but are not looking to pay the ultimate price. Not sure how to use a PAR light meter? Check this video below! To keep a good check on the efficiency and the effectiveness of the growing conditions for your plants, it is a wise decision to employ a PAR meter. Before opting for “the one,” remember that the best light meter would never compromise on its performance and durability. Finally, bear in mind to compare the prices of the products you get interested in and go for a reliable brand for PAR meters instead of fancy knockoffs. 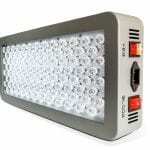 Check out one of our LED Grow Light Reviews right here. Read about the PAR light meters on the market in 2018. We tested four of them extensively and tell you our findings.